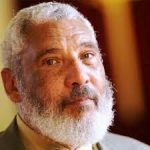 Graylan Hagler, Senior Pastor of Plymouth Congregational UCC in Washington DC, is a leader in the Black freedom movement and an eloquent advocate for Palestinian human rights. By his example he has helped us to see how all struggles for civil rights and human rights are inextricably linked. The Rev. Hagler after return from leading a 2016 witness trip to Palestine he said in his December blog post, “This journey to Palestine is a story that needs to be told because there is so much will to silence the Palestinians and their cause and those who support them. But silence is not an option when your eyes have seen and your heart is filled with memories of Jim Crow, apartheid, discriminations and human beings’ inhumanity to other human beings.” In this season in which we sing “Silent Night”, may our blessed silent nights inspire us to break our silence on what we have seen and heard!